We wish you a day full of wonder, tradition, thankfulness and love as we celebrate the Savior’s birth! I’m sure that there are as many different traditions amongst us Zesters, as the actual number of our daily readership (and probably more). The beauty about traditions is that they are always special, and they always give us the warmth of familiarity, memory, and significance. 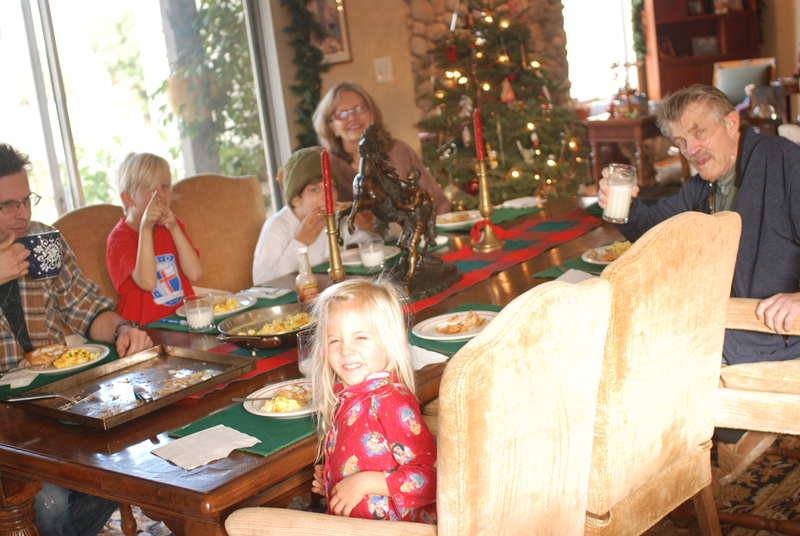 Some traditions may have religious meaning, while other’s have the intentionality of drawing family close together. 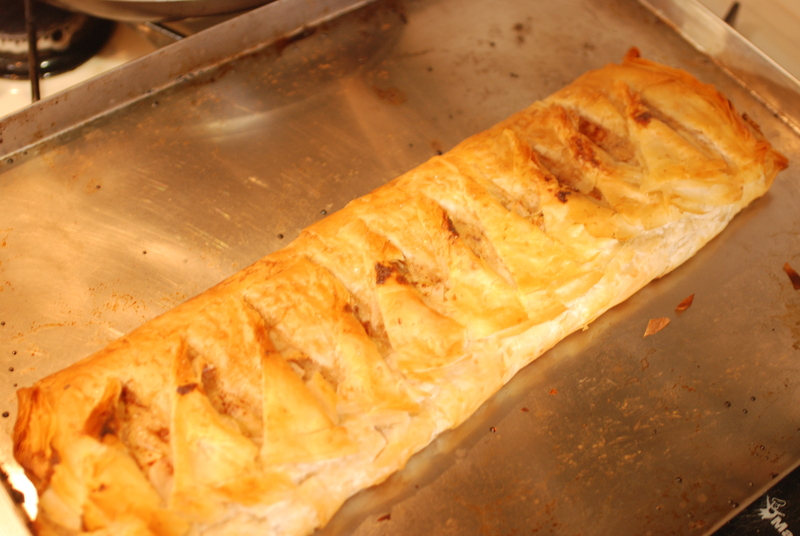 A phyllo dough breakfast danish. 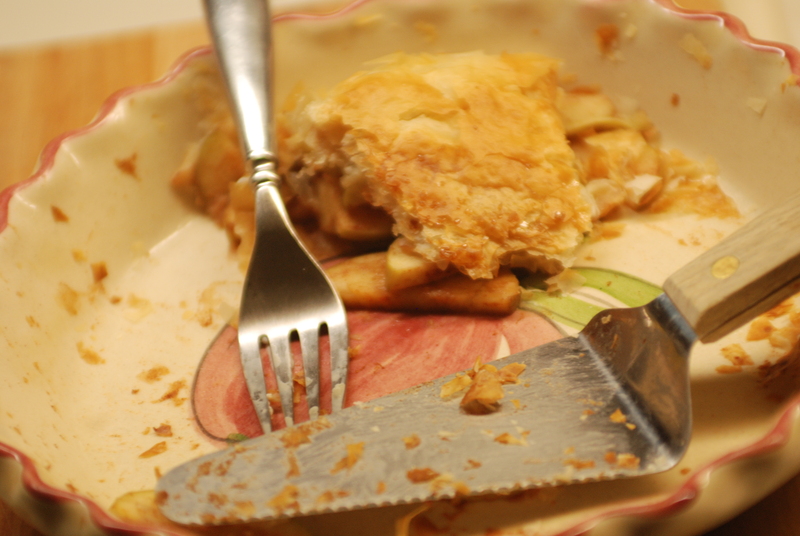 Yah see, last night I made an apple pie with phyllo dough (btw if you haven’t tried this…it’s a must). Since I had ample dough and apples left over, I decided to get creative and make up a recipe. It turned out soooo good, that I had to share with you guys (yup, the kids and adults alike told me to write it down). 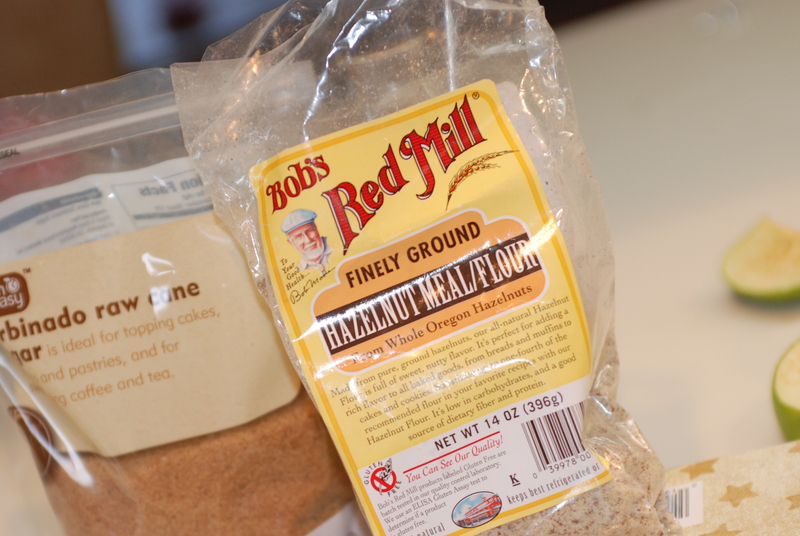 I started with a cup of yummy Greek yogurt and then added 1/3 cup of Turbinado sugar and 2/3 cup of ground up hazelnuts (it would be good with any of the nut meals). Stir it all together and set aside. Time to prep the phyllo dough. If you haven’t ever worked with this kind of dough, don’t be intimidated. It is really quite easy and VERY forgiving (since tears hide so well amongst the layers 🙂 ). The most important step is to have the dough completely thawed before you start (otherwise the sheets stick to each other too much). 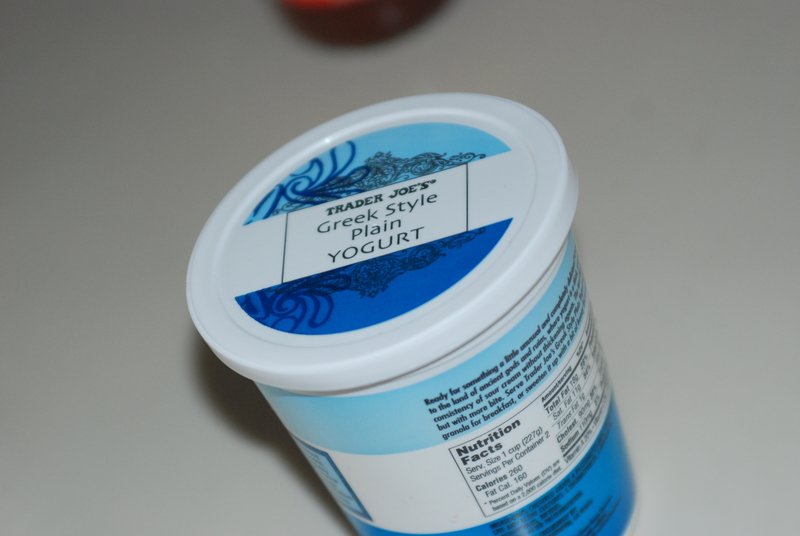 Package directions say to have it thaw overnight in the fridge, or for 5 hours at room temp. (Of course, Miss Impatient allowed it to thaw gently in it’s packaging right over a simmering pot on the stove). 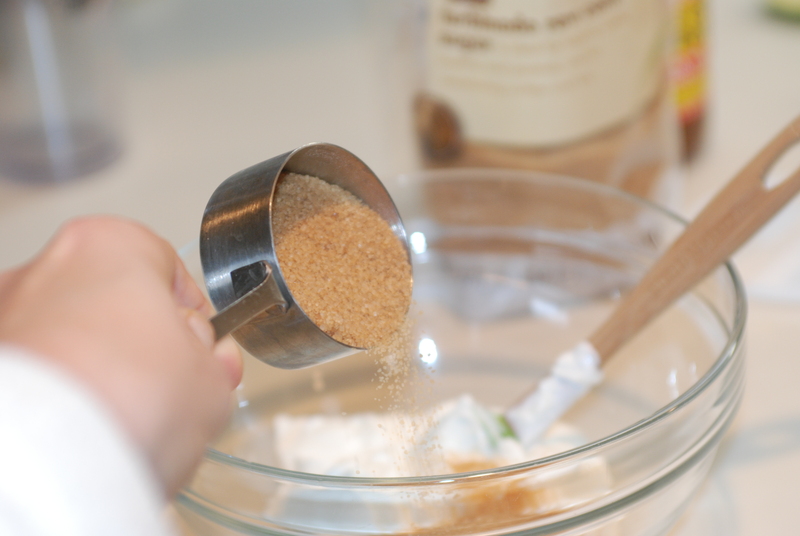 Once you separate the sheets, place one on a cookie sheet and brush with melted butter and sprinkle with sugar. Now, lay down another sheet and repeat. I did a total of about 6 layers before I spread out my yogurt mix. 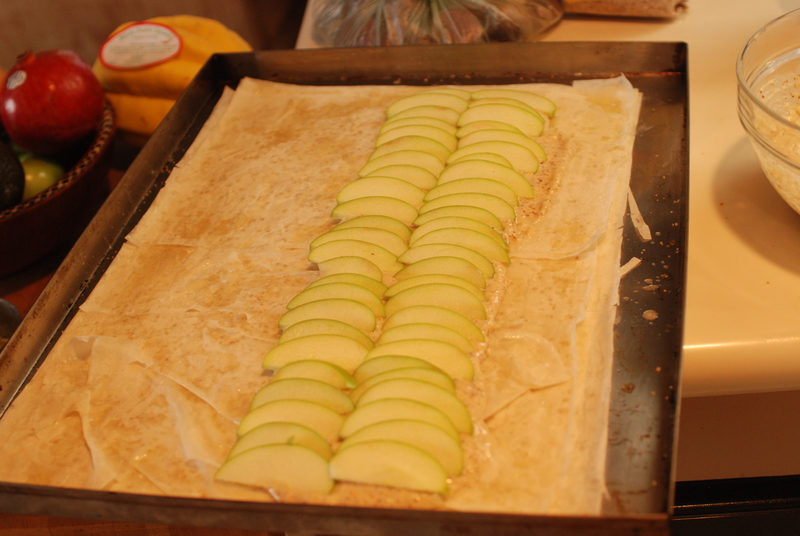 Then, I thinly sliced up a couple of green apples and began to layer. And who wants an apple dish without cinnamon?? 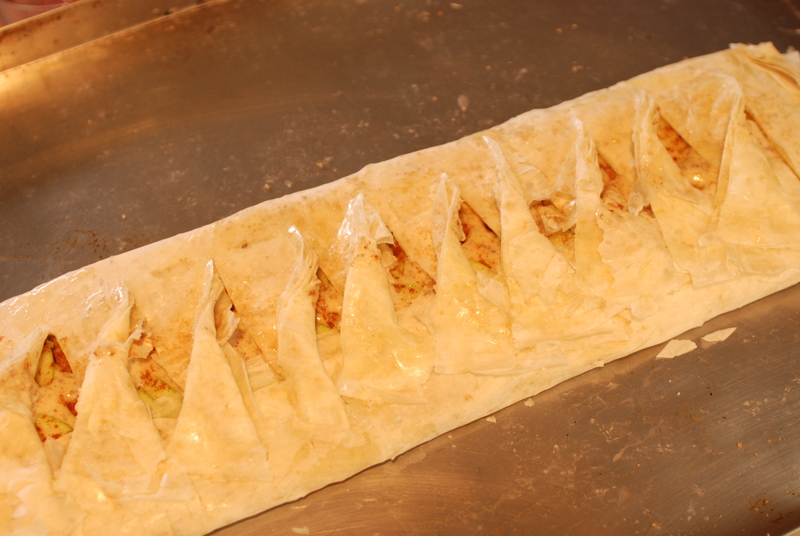 At this point, fold over the short side of the pastry and take a sharp knife to slice “fringe” on the longer side. 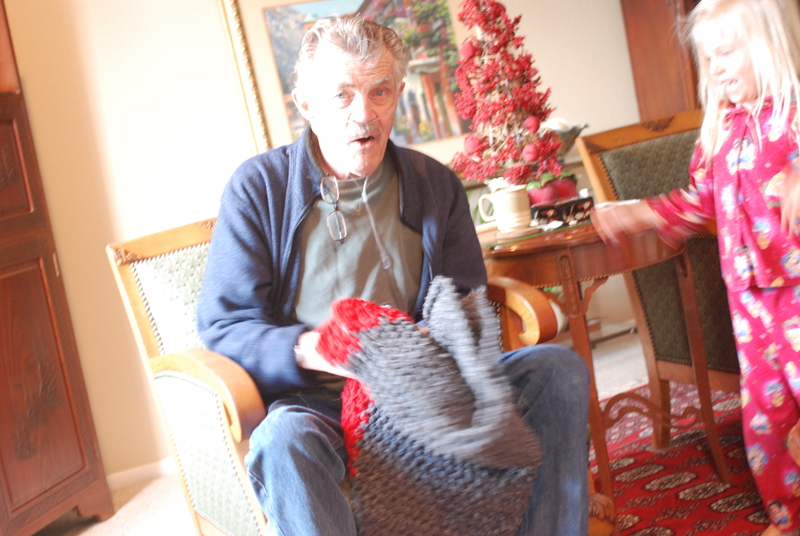 Each “fringe” piece you will twist and then lay completely across. Giving a peek-a-boo into all the yummies that lay beneath. 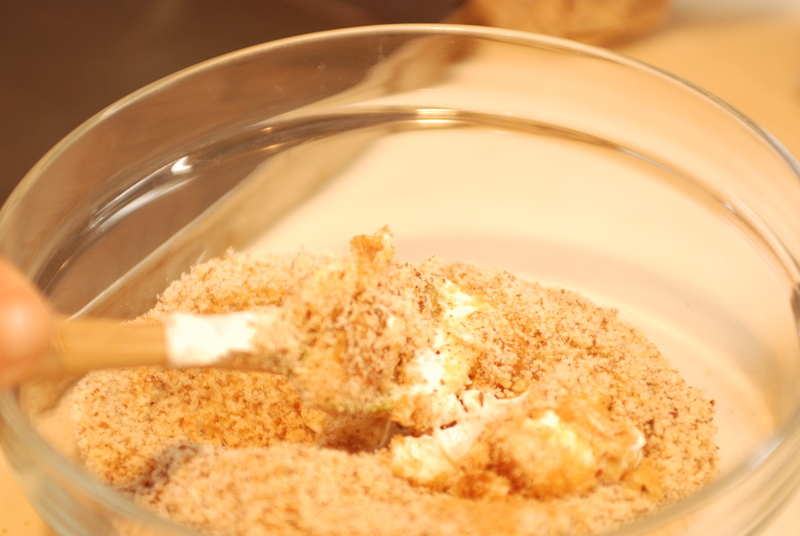 Now bake in a 400* oven for about 30 minutes…watch it as it starts to brown. Gorgeous and ready for a flurry of powdered sugar! Oh, and check out how the pie turned out last night! 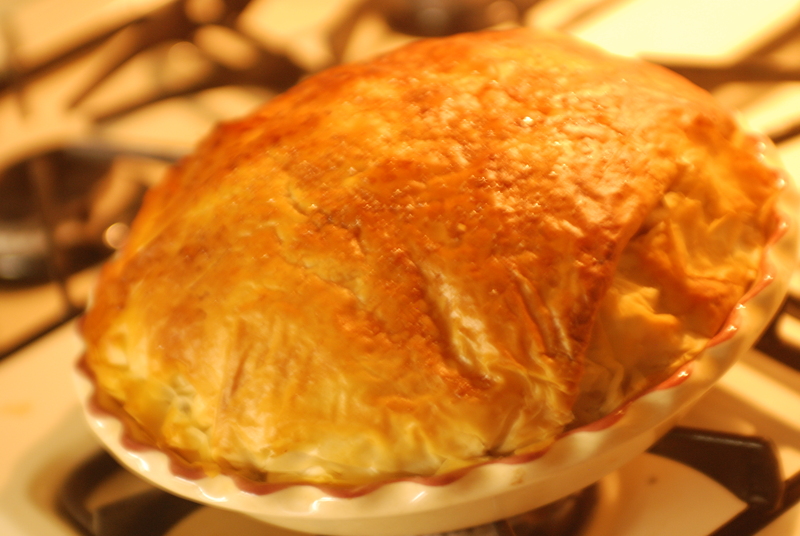 I hope you get a chance to try your hand at a phyllo dough creation this holiday season. 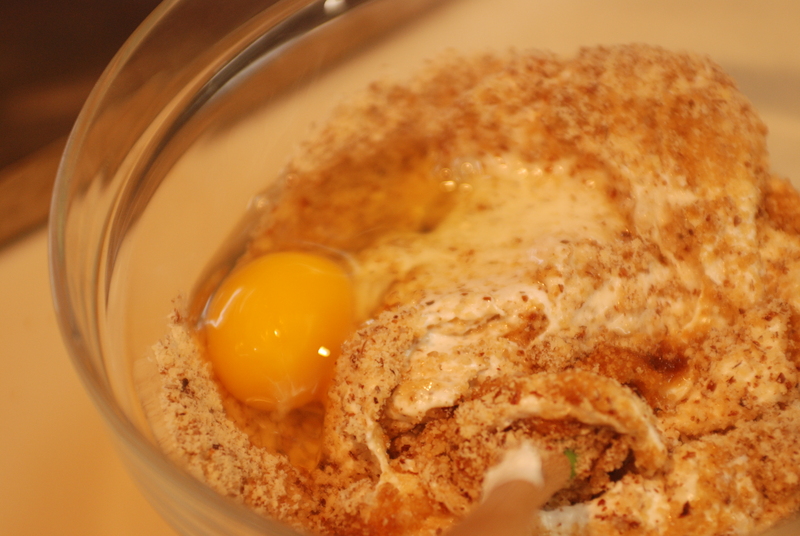 It is ridiculously gorgeous, yummy and easy. Such a cool way to knock some socks off! 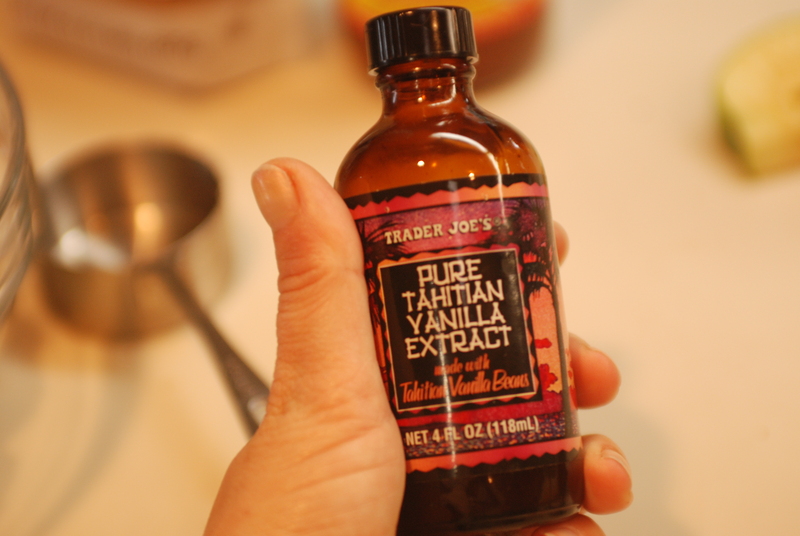 Mix the first five ingredients together and set aside. 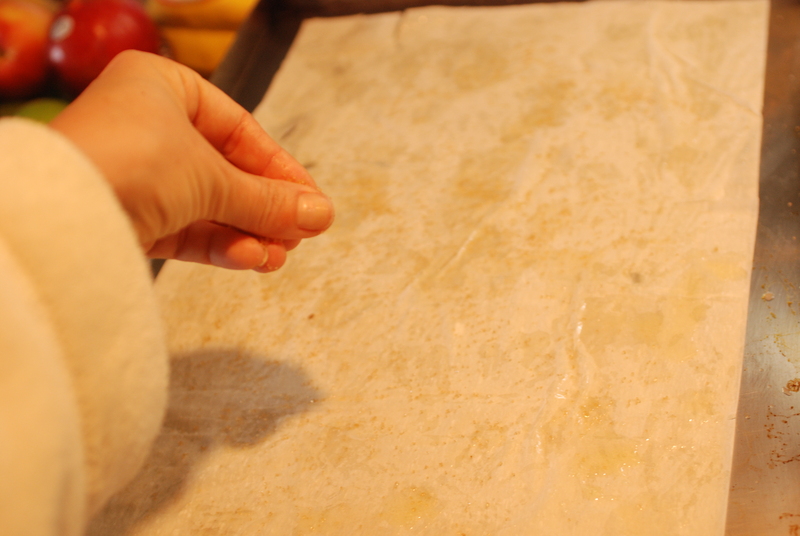 Place your first layer of phyllo sheet on a cookie sheet. Brush some butter and sprinkle with sugar. Lay another sheet on top and repeat until you have used up all the sheets. 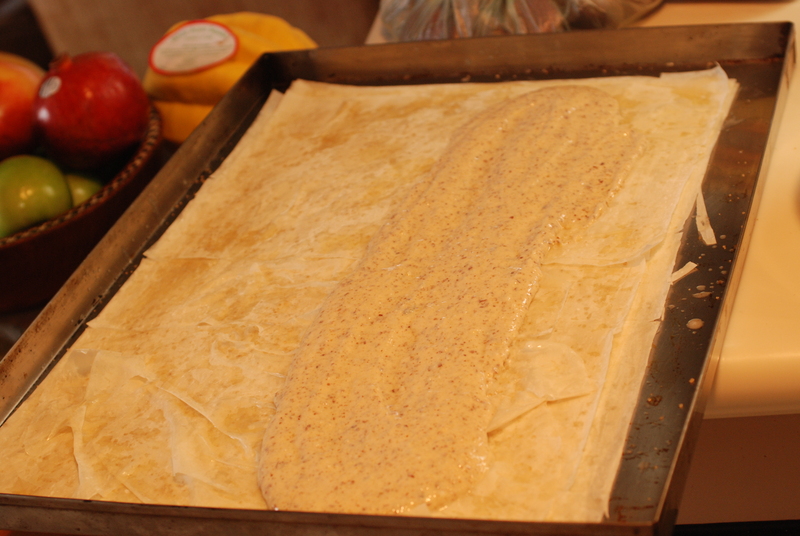 Now spread the yogurt mix on the phyllo, just off center. 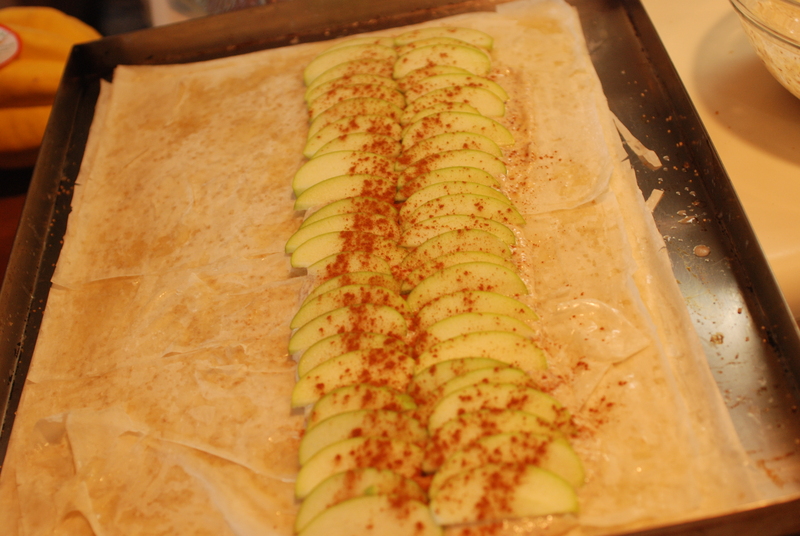 Begin layering on the apples and dust with cinnamon. 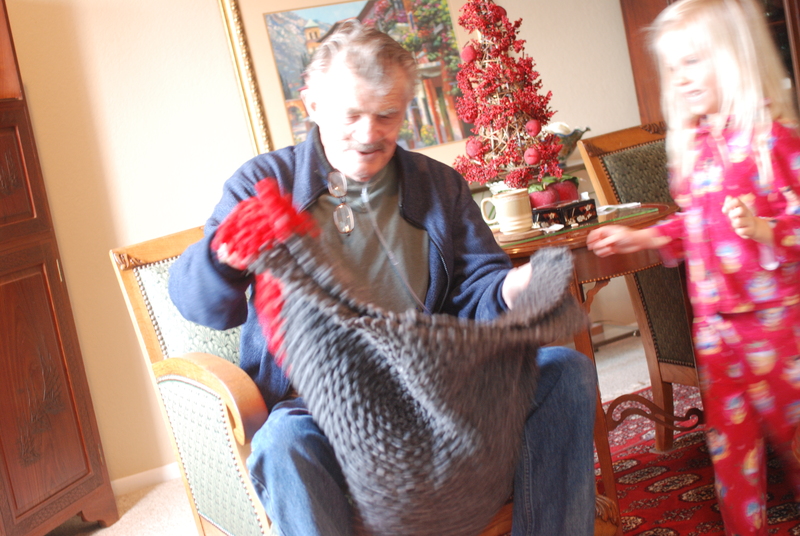 Now, fold over the short side. Using a sharp knife, slice a fringe on the long side with strips that are an inch in width. 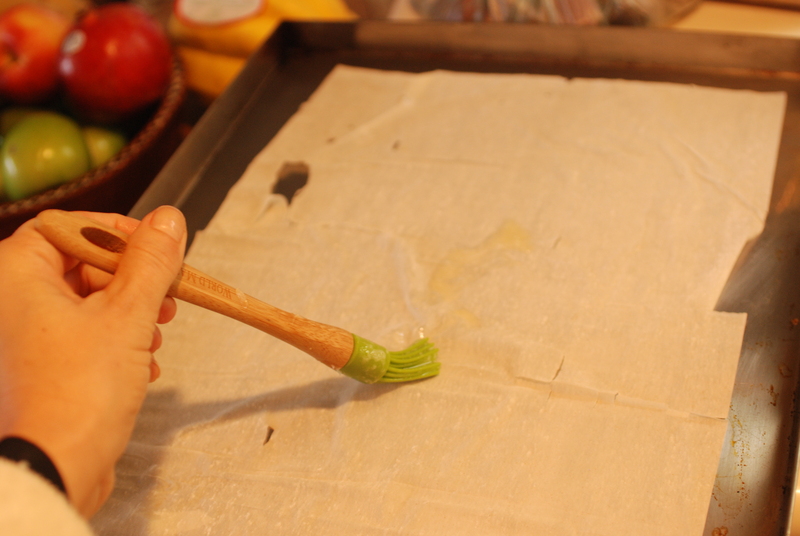 Fold over and twist these one inch pieces to lay across the apples. Bake at 400* for 30-40 minutes. 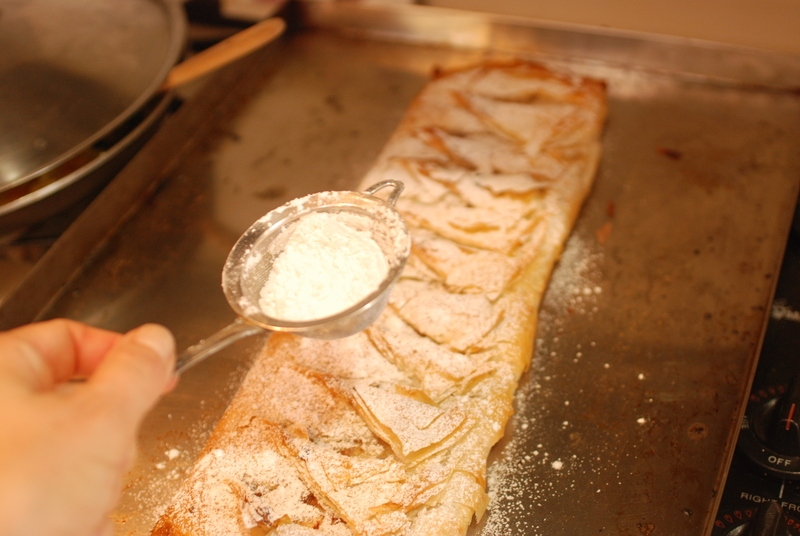 Dust with powdered sugar and serve…it’s gonna go fast!! Merry Christmas!! Prayin’ your day is full and merry! !